I wake up on Christmas morning and lay in bed for a few minutes. 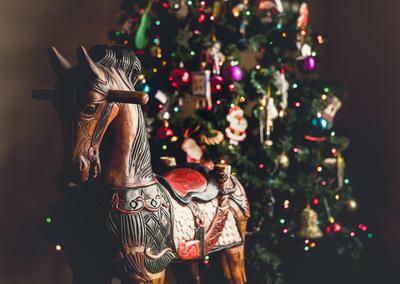 I had honestly lost hope in getting a horse on Christmas morning. I had dreamt of it for four years and every year I've been disappointed. I told myself not to get my hopes up this year. I tried not too but I want a horse so much it honestly doesn't feel right to give up completely. A few minutes later, my parents call me to the living room to open gifts. I sigh and slowly get out of bed, glancing at the pictures of Riley and Peppy on my desk. I head into the living room to see the tree filled with presents. I sit down on the couch my heart hurting worse with each second. That's when my whole world turned upside down. A loud whinny came from outside. Without a second thought, I leapt off the couch and jerked open the front door. There stood my trainer holding Riley. His gray coat blending with the white snow. My heart nearly stopped as I tore outside no coat or shoes. Riley nickered a greeting, his ears perked. I threw my arms around him so many emotions running through me. "He's all yours," my dad said. The words that changed my life... I had a horse of my own.